Stars of vol. 1, Honkies and Peeping Drexels bless us today with split single Bills Drift/Pagans. Two factions from the South East of London, the single showcases two of the city's finest musical forces at their grisly best. Honkies playful mangling of rockabilly, garage and synth pop pogos its way through 3 glorious minutes, whilst with Bills Drift, Peeping Drexels transport you to the sadistic mind of a drunk driver. Interviews with both bands can be found in vol. 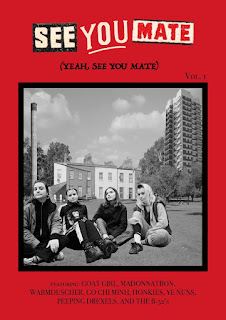 1 of See You Mate, of which there are still several copies left here.